First thing that comes to my mind is using a shell script within the rules condition which checks for names in the file path. So the rule is only executed when the file is in a certain folder within the directory. If you use multiple of these scripts with an "if any", then you could have one rule at the top level which is executed within the directory in different folders. → If a folder named "legal" is in the files path, then execute the rule. Of course, if the depth of the folders is only 1 folder within the main directory this would be working with a nested condition checking the enclosing folder. But maybe there is a more elegant way of doing this. unfortunately this does not correct the issue that I have - because if I put this script as a condition - then the only action would be "run rules on folder contents" - then what will happen is ALL the rules that I have will be run... but I need only one out of many rules to run. Again thank you for trying to help! Ah – I just recognized, that you asked the other related question here, too. 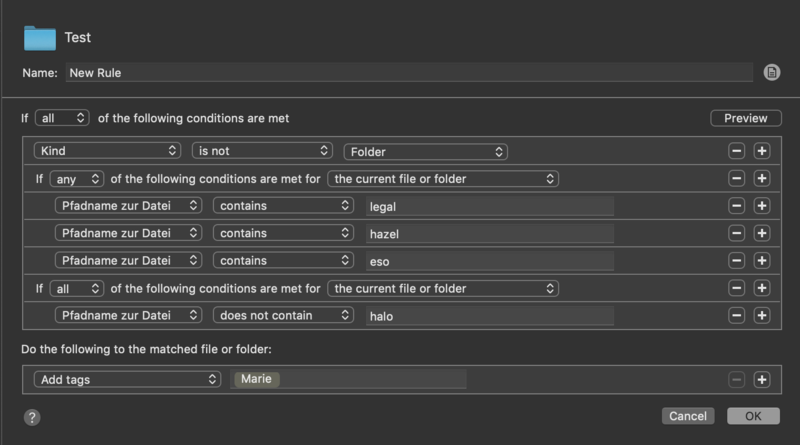 Hazel will then check all the other rules, so the tag-rules I have next to the "go-into-subfolders" rule, within all the subfolders of the main directory. What I am now suggesting is, that you do not change the way hazel is going into the folders, but when it is executing the other rules f.e. the tagging. So if you have a condition within the tag rules like: look for the file-path and check if it contains a certain name, then the rule will only tag those files of the whole subdirectory where a certain name is in its file path. That way, even though the "go into subfolders" rule applies to all folders, the tagging only happens in certain folders within the desktop. So for each tag you have to set a certain condition where it should tag. 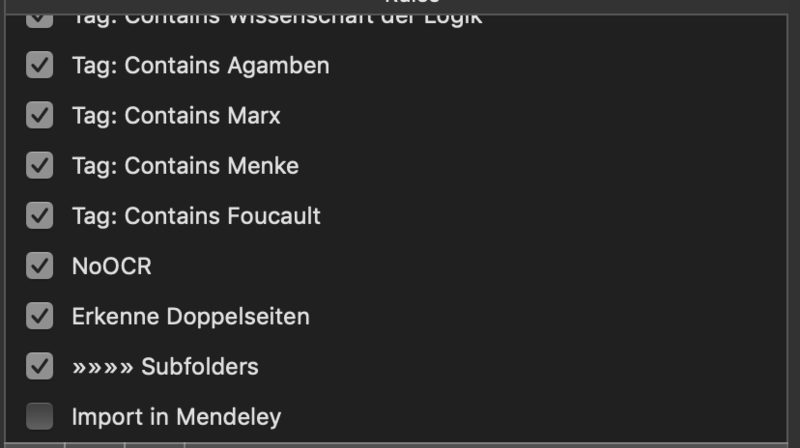 If you then combine these with a nested "if any" condition you can tweak every "tag" rule to be executed in more then one folder, but not in all folders. Can you provide more details on what rules you want to run on the files within? I was working on rules that would add tags based on certain parameters... and with Robert's help I was able to figure out a solution - where I set a limit by certain text contained in the files path... so thats all done. Can you post/email an excerpt of the logs?